Happy First Birthday, Genealogy Roots Blog! I've been doing this crazy genealogy blogging thing for a year now. I started this blog a year ago today. The original idea was to list updates to my various directories of online genealogy records. But then I started adding all sorts of unexpected things. And I made some new online friends from this. I hope you've found some helpful genealogy sources from reading this blog. And thanks for stopping by. 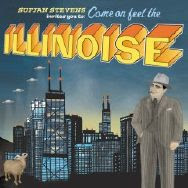 In 2005 a rather obscure musician/songwriter named Sufjan Stevens released an album called Illinois that is slowly making its way toward underground classic status. Apparently Mr. Stevens would like to make 50 such albums, one for each state, but he has quite a ways to go. In 2003 he released one for Michigan. And now just 48 states remain between him and immortality. The first song on the Illinois album is called "Concerning the UFO Sighting Near Highland, Illinois." And now you know that Highland is the Roswell of Illinois. My great great grandparents, Frank and Mary Appel, came (separately) from Germany and settled in Highland, Illinois in the middle of the 19th Century. Frank was briefly on the first Highland city council, but he didn't like it that pigs were roaming around everywhere, so he and the other councilmen passed a law banning livestock from the city limits. The local farmers didn't like this at all and Frank was not re-elected to the city council - he received a mere 6 votes in the election. Let this be a lesson to all you politicians out there who do stupid things. Instead he opened a saloon, which was probably frequented by space aliens and drunken pigs. My favorite song on the Illinois CD is "Chicago" which is about the city where my brother was born. Ok, he was actually born in Cook County, in a place called Des Plaines, which is also where Ray Kroc started building his McDonald's restaurant chain. The best thing about the album really, aside from all the melancholy songs and quirky arrangements, is the weird song titles. Here's one: "They are Night Zombies!! They are Neighbors!! They Have Come Back from the Dead!! Ahhhh!" That's really one of the titles. It's an Illinois thing. You'll understand if you once lived there or live there now. Or if you have saloon-keeping great great grandfathers from Highland, Illinois, who were not liked by zombie pig farmers. -former Cook County resident, Joe B.